Friday was our last day of school before our Christmas Break. Boy, are the children ready. It's almost like they have been living on chocolate chip cookies for the last week. They are very EXCITED Christmas is coming. So just to jazz things up a bit--like the children needed it--we had a great activity on Friday. I LOVED it and the children talked about our day continuously. Mrs. D created a Gingerbread Day. This is an activity she used to do when she was a kindergarten teacher. 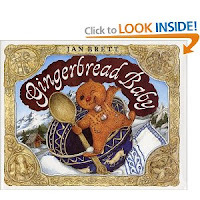 First we read "The Gingerbread Baby," by Jan Brett. At the back of the book was a note from the Gingerbread Baby telling the children he was hungry and had gone to the kitchen for a snack---you should have seen their faces! We rushed down to the kitchen. There we found a note that the Gingerbread Baby had decided to go to the church to say a prayer. We quietly went to the church. When we got there, the Baby had left a note that he wanted to sing a song, so he went to the stage to perform. Quick...to the stage. When we got to the stage there was a note that the Gingerbread Baby had traveled to our front door. Then he left a note he was waiting to see us in our classroom. When we got to the classroom there was a note that said his mom made him go home, but he left some supplies for the children to make one of him. Here is where the activity was a bit different then Mrs. D's original activity. She used to have parents bring in plain gingerbread cookies, then the children decorated them. Because of time we had a gingerbread shape, buttons, eyes, crayons, and glue available on the tables when the children got back to the room. Then, they children made a Gingerbread Baby to take home with them. The kids really, really, liked this activity. It was one of the first things they told their parents before our Christmas show began. There were even a few children that "saw" Gingerbread Baby footprints. This is definitely an activity we will be doing every year. I loved seeing how excited they all got. We also made Hershey Kiss Pretzel Bites--just what they needed, more sugar.